Sometimes the discussion that broader design pieces generates results in a lot of disjointed conversations in the comments. There are a number of issues raised in BfZ threads that I'd like to continue with a more focused approach. First up is going to be a good look at my manabond mechanic. 5/27/2015 - How do Eldrazi spawn grow into monstrous titans? Horribly, violently, and unpredictably. Design a card with this art addressing the sea creature trope. Don't use islandhome. Bonus points if your mechanic can be reused across blocks and at common. Does it warrant a keyword? There are a few more mechanical areas that we need to explore before we start selecting keywords for the final count. Today I'm tackling some land mechanics for the set to dabble in, and taking a look at the needs and wants of the inscrutable Eldrazi. 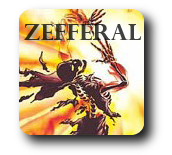 5/21/2015 - I'm wondering about exploration mechanics Zefrikar could use. Something that doesn't directly affect combat and that feels like a discovery or expedition. Maybe like Search the Catacombs. I'm sure this one needs work (it's pretty long), but I do like it as a jumping off point. 5/20/2015 - Reuben was musing yesterday about how best to template a mechanic first proposed for Tesla some time ago. What's cool about access the machine is that you pay once to activate a number of abilities across your permanents. The trick is we can't just label those abilities with an ability word because the game can't see ability words. We can make all the abilities trigger whenever you "access the machine" but that means we've got this action word that does nothing on its own. 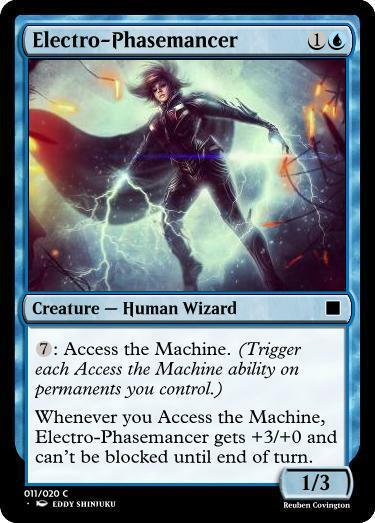 Players expect everything in the game to do something, and so we've got to include reminder text that explains that accessing the machine has no inherent value, but triggers abilities on your cards with the ability. Awkward. Now that I've solidified my stance on Landfall's return in Zeffrikar, it's time to look at the other Zendikar mechanics a little more in-depth. I've already given my one-sentence ratings for these, but we can dig a little deeper. On MTGO, they just released this really cool idea of a product (I can't testify as to whether it's actually cool or not, I avoid MTGO most of the time). Tempest Remastered. Take a block that wrapped up seventeen years ago, cultivate the cards from across the sets down to 250 or so, and make it as close to modern draftable as the card pool allows. It's a great idea, and I hope it sells a billion digital packs so they do it with some other blocks. It's a set that lets them capture the nostalgia of the past sets while skipping over the fact that they're pretty terrible to draft with by modern standards. 5/14/2015 - Eternal Faun wonders if red can do recursion on a creature other than a phoenix. Red isn't really about recursion or flying, but it makes exceptions for firebirds and dragons. But that's a very one-sided perspective. Consider that Magic doesn't need the phoenix to satisfy players' flavor requirements like it needs dragons. Do we see them so often purely for nostalgia's sake? Or do these recursive red birds serve a functional purpose? And if they weren't the only example of red creature recursion, they wouldn't be exceptions at all—Is that a space red can embrace? Greetings, artisans! You likely know that I design games outside of Magic. I'm proud and excited to announce that my bluffing and deduction micro-game Cunning Folk launched this morning on KickStarter. It funded quickly, but I'd be grateful if you'd take a moment to check it out and see if it's of interest to you. The Eldrazi annihilate Zendikar. Having failed to save the plane, several planeswalkers regroup on Alara, and the Eldrazi follow their trail, ready to claim their next planar victim. There's a plan to catch the Eldrazi in the maelstrom, or to re-fracture the plane in an attempt to trap or fracture this menace to the multiverse. Design a card with this art for this theoretical set that demonstrates something unique to the set or to the plane. Bonus points for lower rarity. Goblin Artisans is a community — a safe space where we can brainstorm freely, ask 'dumb' questions, and share 'wild' ideas. Everyone is welcome to join in the conversation, and to learn and grow as designers with us. As with all creative work, critical feedback is necessary to the improvement of our designs and to our skills in general, and so we value constructive criticism of our own and each others' work. But even as designers learn to thicken their skin and disassociate negative observations about their work from attacks upon our identity, we remain human and our emotional well-being can be fragile. With that in mind, it is vital that each member of this community treat others with respect. It can be easy to forget people's feelings online, and impossible to gauge their true intent or response. We must remember our humanity, and never belittle, other, or insult. Please take care in how you express yourself, and be prepared to apologize and forgive. Anyone who callously disregards the emotional well-being of others will be suspended or banned. We will not tolerate bigotry in any form, including sexism, racism, ableism, elitism, or discrimination based on gender or sexuality. 5/11/2015 - I designed Aetherphobia to explore the possibility of a counterspell that helps someone who is behind catch up more than helping someone who's ahead maintain the lead. Aethertwist was just a bonus idea coaxed out by the art I found. 5/7/2015 - Why not make the cycles-from-play mechanic MaRo hinted at so many years ago a formal keyword? The Tesla project was initially envisioned as a stand-alone large expansion that would try to adhere to all of the design principles and policies that Wizards of the Coast R&D applies in making actual Standard-legal sets. But that was years ago back when we got sets like Rise of the Eldrazi. With the new two-block paradigm, all Standard-legal sets will be part of a two set block. Even if we're only doing design for the large set of Tesla block, an essential piece of the process is looking at a larger block plan. Design a card for this art that features a new or under-used form of card advantage. Failing that, card advantage appropriate to common. 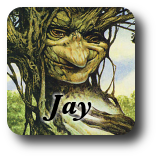 5/5/2015 - Let's explore non-permanent double-faced cards a while. The Sol Forge mechanic seems like a promising place to start: The first time you play a card, you 'learn from it' so that the next time you play it, it's stronger.